Last Thursday around 300 Palestinians gathered in Ramallah to prepare for a direct action in a location known only to a few key organizers but that would soon be seen in media around the world. The next day they traveled under the disguise of a Palestinian wedding party and converged upon a patch of land in the center of the proposed E1 corridor between Jerusalem and the large Israeli settlement of Maaleh Adumim, flags, tents and olive trees in hand. The mission of this apparent wedding party was to create a new Palestinian village. Bab al-Shams — meaning “Gate of the Sun,” a name taken from the novel of the same name by Lebanese author Elias Khoury — was established at around 6 a.m. on the morning of Friday, Jan. 11. By Sunday the 13th, in the declared interests of Israeli security, the camp had been broken up by the Israeli army. A smaller group of activists returned the following Tuesday to plant olive trees on the site, resulting in 20 arrests. This week on the West Bank, Bab al-Shams is never far from anyone’s thoughts. The clearing of the camp was the result of an executive action by Prime Minister Benjamin Netanyahu that overturned a ruling by the Israeli Supreme Court that had given the demonstrators six days to leave the site. “We will not allow anyone to touch the corridor between Jerusalem and Maaleh Adumim,” Netanyahu said, according to Haaretz. 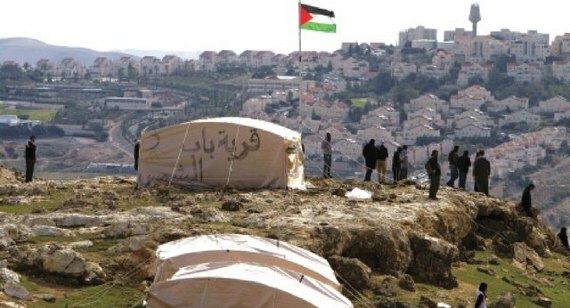 The camp itself came in response to Netanyahu’s announcement of plans for settlement construction in E1, an apparent act of retaliation following the success of the Palestinian bid for upgraded status at the United Nations. Construction there would effectively cut East Jerusalem off from the rest of the West Bank. “At about 1 a.m., 1,500 soliders came,” Musa Abata, who was present during the eviction, told me. “Where the media [could see] they didn’t hit people. Where they couldn’t, they hit. Every person had at least five soldiers pinning them to the ground before they arrested him and took him to the bus. The Popular Struggle Coordinating Committee (PSCC) is a network of popular committees in villages and towns across the West Bank that seeks to unify Palestinians across geographical and party lines, as well as to organize supporters in Israel and around the world. Social media have featured heavily in their campaigns. Abdullah Abu Rahman, who is from Bil’in, is quick to point out that their approach is steeped in nonviolence, which he considers to be a Palestinian tradition. Bab al-Shams represents a new level and scale of coordination for the PSCC. Organizers claim, also, that were it not for the snow and storms that disrupted many people’s lives in the region the previous week, turnout would have been ever higher. Among Palestinians, feelings seem mixed. Some are afraid that actions like this could result in more severe treatment of Palestinians by the Israeli military. Abu Rahman acknowledged the difficulty of persuading more Palestinians to make the sacrifices and take the risks that this kind of activity involves, but he is optimistic that a critical mass can be gathered — step by step, victory by victory. Actions such as that at Bab al-Shams represent an attempt by Palestinians to change the “facts on the ground” — a phrase that is often used by Israeli settlers to describe their strategy for the de-facto annexation of the West Bank. This kind of deliberate subversion of settler rhetoric was also used by organizers to describe Bab al-Shams as a “legal Palestinian settlement on Palestinian land,” as opposed to the Israeli settlements on Palestinian land, which are illegal under international law. The founding of a new village is a powerful alternative to the image of a young man throwing a stone — an ubiquitous symbol of Palestinian resistance, both for outsiders and for Palestinians themselves. Like the stone thrower, the village represents pride, defiance and resistance, but the latter goes beyond merely pushing back against the occupation or matching its aggression. It’s an attempt to enact a vision of what comes after the structural violence of occupation is ended. Derek Oakley is a peace worker, trainer and writer. He takes a strong interest in radical art, civil society movements, and African and Middle Eastern Politics. He is currently based in Yanoun, near Nablus, as a participant in the World Council of Churches EAPPI programme. He blogs at Critical Path and Yanoun. will pay for a single medical condition, and on how long they will continue to cover it. I’d love to hear your thoughts on revamping and reforming plans such as these to give the economy a much needed boost. 9 March 2011, Manhattan Institute for Policy Research,.